The ultimate goal – both for India and for all nations striving to foster economic growth and global competitiveness – is to put in place policies which lay the groundwork for the creation of a true knowledge-based economy. 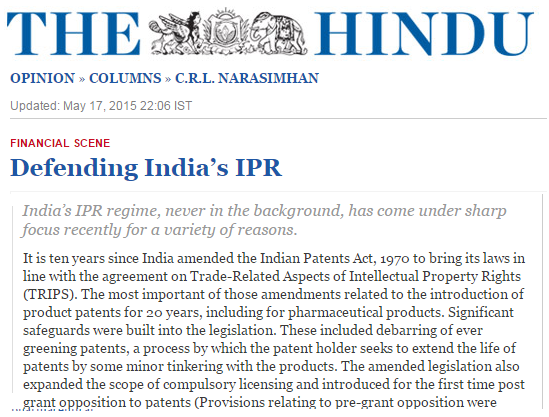 For that to happen, the government must create guidelines which provide greater legal certainty for private sector investors, create a viable technology transfer mechanism, and foster greater enforcement of legislation aimed at protecting IP-intensive industries in India. Each of these factors, in turn, will support the creation of a robust innovation ecosystem, one from which India surely has the most to gain. "This is a technology driven era. 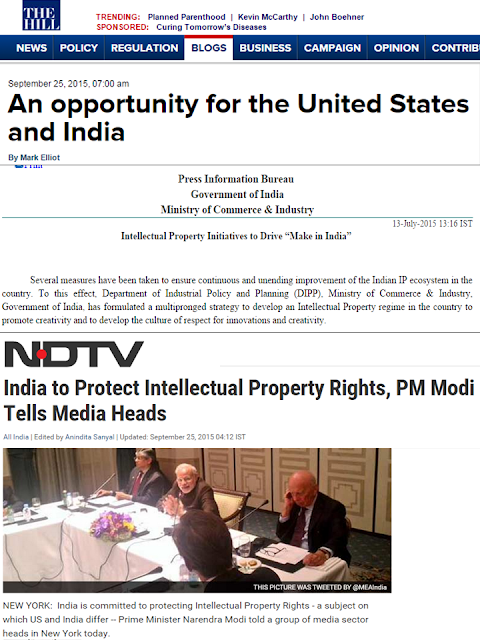 We are a technology driven society... We are committed to protecting IPR which is essential to fostering creativity," PM Modi said. In May, the US had kept India and China on its Priority Watch List of trading partners that fail to protect intellectual property rights of its enterprises that invest in India, hurting the economy. Thanks to those pieces of good news. It is not possible to have more revolutionary and costly innovations in many sectors and sub-sectors of an economy if the inventors and innovators cannot internalize the rewards of success and the losses of failures, simply because a horde of copy-catters are just milling around to say later on, "we also invented that" and do good business even if they contributed nothing to the discovery of new molecules, industrial and circuit designs, new songs and books, and so on. Meanwhile, Pugatch-Consilium released its new report, the Biopharmaceutical Competitiveness and Investment (BCI) Survey 2015. From the few selected countries covered by the report, here is the summary of BCI scores and ranking. 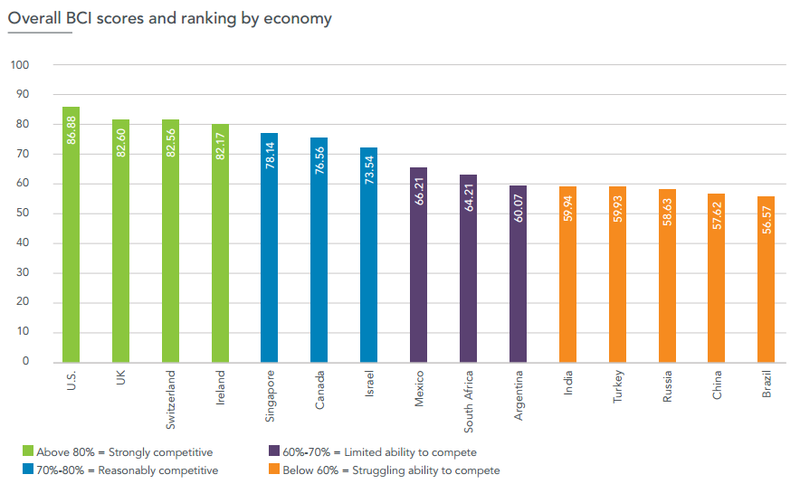 India ranked 11th out of the 15 countries surveyed. For India in particular, a score below 60 means that it is non-competitive in biopharmaceutical research, clinical trials and investments. The US Chambers' GIPC also released the supplementary statistical charts and analysis, Unlimited Potential, also prepared by Pugatch-Consilium. 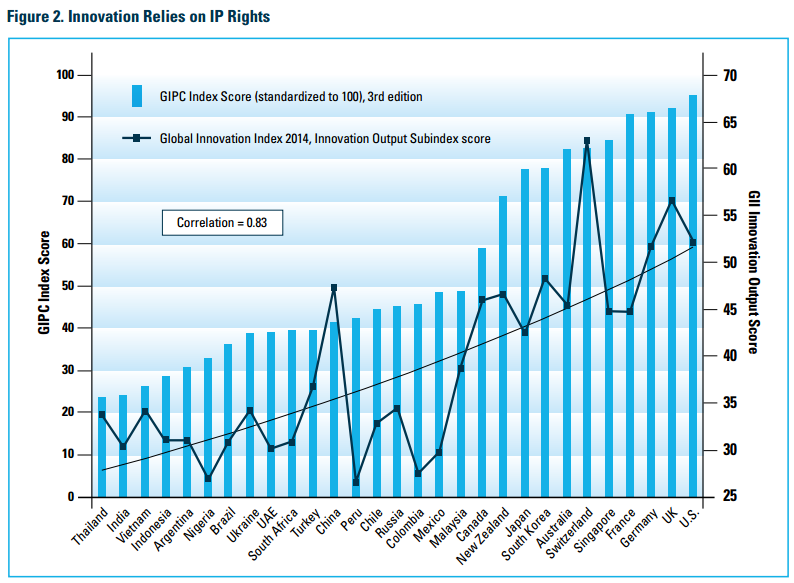 Below, the report plotted the data of the GIPC Index Score and the Global Innovation Index 2014. 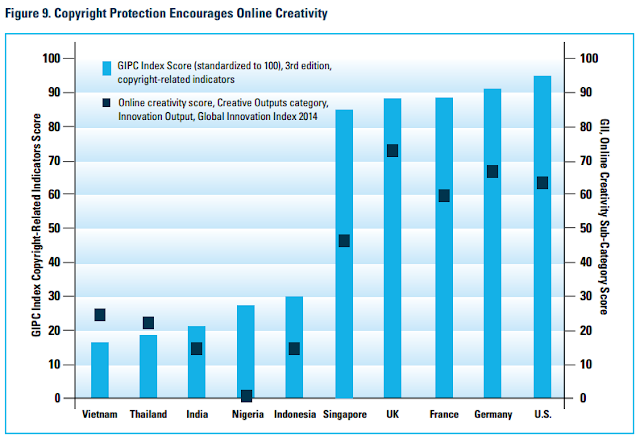 While Singapore, S. Korea and Japan scored high, India and Indonesia scored low, though not as low as Nigeria's. Also a plot of GIPC index score and Online creativity score, and India and Indonesia scored low, though not as low as Nigeria's. Hence, the recent pronouncements by PM Modi. He needs to counter the low or negative image of India when it comes to respecting and protecting the various products of the mind and intellectual entrepreneurship. The main role of government in this case is to lay down rules that are fair and transparent to all players, to protect private property whether they are physical or non-physical/intellectual. The first time I went to Washington DC in the US was in May 2004. I was one of several International Fellows of the Atlas Economic Research Foundation, then based in Fairfax, Virginia (now based in DC), and I attended several conferences in the US. First was the Mackinac Leadership Conference in Michigan, then the Heartland conference + Atlas Liberty Forum in Chicago, then meetings in DC and Virgina area. I stayed in the US for one month. 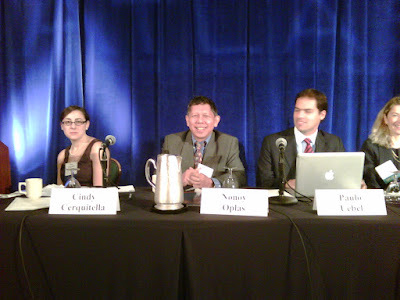 The second time I went to DC was in November 2009, also for another Atlas event and I was one of several panel speakers. Below, with Cindy Cirquitella of Atlas as panel moderator, Paulo Uebel from Brazil, and about three other speakers from Croatia, Nigeria, and Argentina I think. Thanks again to former Atlas VP, Jo Kwong, who would find funding for my travel scholarship. See Jo Kwong rocks. Some of my notes during the Atlas events that time are here, Economic freedom means taller people. 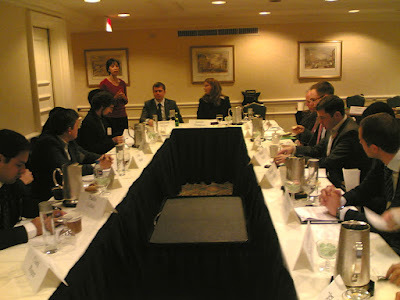 I also attended a one-day discussion on several literatures about liberty. Below, Jo Kwong, in red dress, standing and introducing the activity. Then I visited again the Americans for Tax Reforms (ATR) office. First time I saw their office was in 2004 and it was my first time to meet ATR President, Grover Norquist. Very articulate and intelligent free market leader. 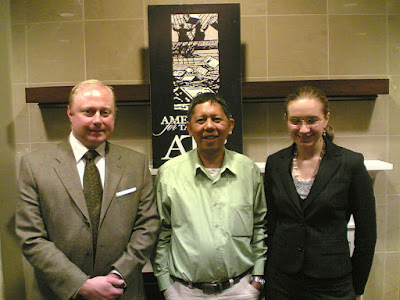 Below, with Grover's deputy, Chris Butler and a Russian lady scholar, Victoria Strokova, who authored the International Property Rights Index (IPRI) 2010 Report. 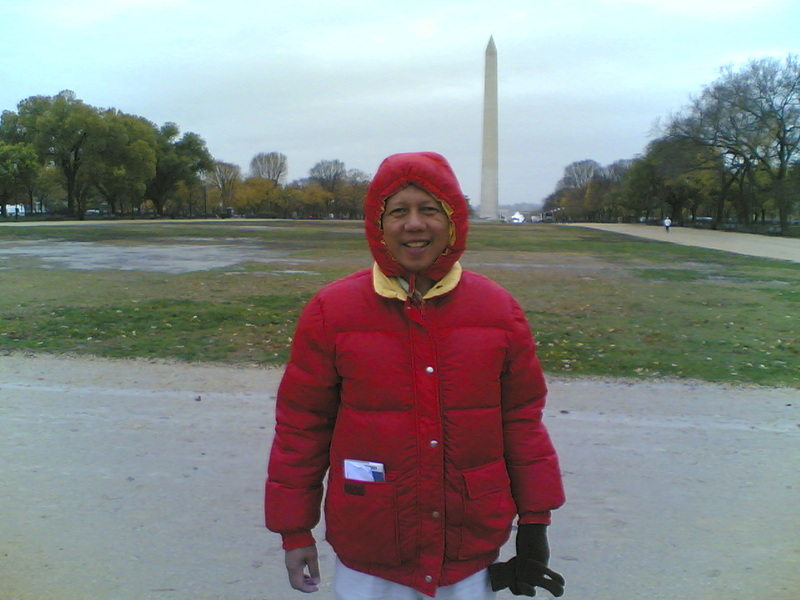 It was a freezing November for me; the locals would wear some not-so-thick jackets while I covered myself with a thick jacket even at daytime. Soon, I will visit DC again for another conference and some meetings. Ronald Reagan National Airport, Arlington, Virginia -- I exited the US from this airport twice, in 2004 and 2009. Eco-protectionism is wrong. The idea that countries and economies should erect new trade barriers on top of existing ones, tariff or non-tariff, to cut carbon emission is wrong. Trade precedes growth and development, inclusive or otherwise. (S. Africa) Trade and Industry Minister Rob Davies... said "eco protectionism" was emerging under the guise of addressing climate change concerns, particularly from advanced countries. "At the same time, however, another form of protectionism is threatening to assert itself: imposition of trade measures, ostensibly for reducing emissions of harmful greenhouse gases (GHGs). The two dominant economic powers, the US and the European Union (EU), have signalled the introduction of domestic legislation for reducing emissions of carbon dioxide, one of the principal GHGs, by establishing standards for their domestic industries. But, perhaps more importantly, they have also indicated that these standards will be imposed on imported products. 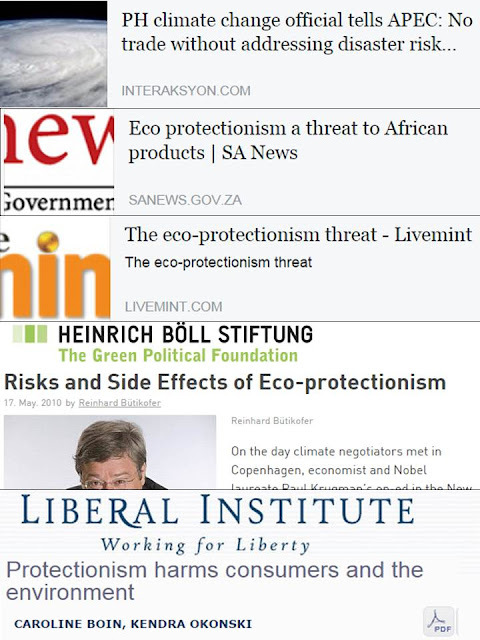 A new form of “green protectionism” is, therefore, on the anvil, one that has been aptly described by Prof. Scott Barratt of Columbia University as “eco-imperialism”. 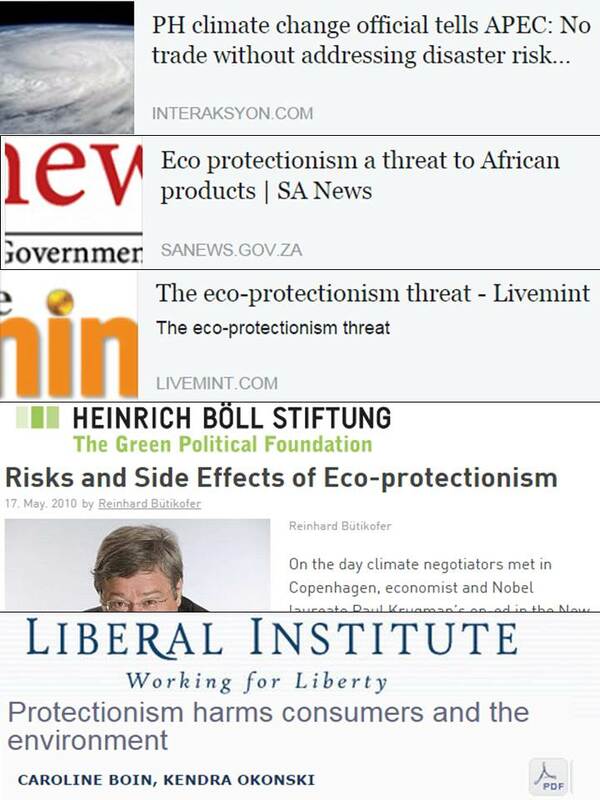 Even someone from the German Green political foundation, HBS, signaled caution against eco-protectionism. Firstly, European industry has already been granted a number of exemptions from emissions trading and thus achieved considerable cost advantages. Additional climate tariffs would not be legitimate protection but protectionism. Secondly, important industries such as car manufacturing have unfortunately already won pyrrhic victories against modernisation. Protective tariffs would only further encourage such obstructive behaviour." "Environmental ideologues continue to make dour prognostications about our planet's future, claiming that we all must consume less, have fewer children and trade less with each other to address climate change. Based on their scaremongering and frankly embarrassing record of false predictions in recent decades, these claims should not be heeded seriously. Such demands may suit the protectionist agenda but they have little merit in terms of their practical ability to enable humanity to use scarce natural and human resources in an ever-more sustainable manner. On the refugee crisis in Europe (mainly coming from Syria) and East Asia (mainly coming from Myanmar). One possible solution is for the EU and ASEAN countries to buy one island respectively, and put all the refugees there. That island should become a new country someday with its own government and territory. Meantime, EU and ASEAN countries, other countries outside the respective unions, theUN and multilateral, foreign aid agencies should chip in and help, plus individuals and civil society assistance, will give foreign and humanitarian aid to those islands of refugees. The aid is short-term, something like five yearsuntil the new settlers have put up their own government and become self reliant. Where to buy an island for this purpose? For Europe, maybe in one of the islands of Italy, or the Mediterranean, I am not so familiar with Europe geography. For East Asia, in one of the islands of Thailand, or Indonesia, even in the Philippines, although we are too far from Myanmar, unlike Thailand, Malaysia and Indonesia. Any of those governments can sell an island, the rest of the union member governments (EU, ASEAN) can chip in money to pay it, send initial humanitarian aid. Some islands are big enough to host two million people or more. 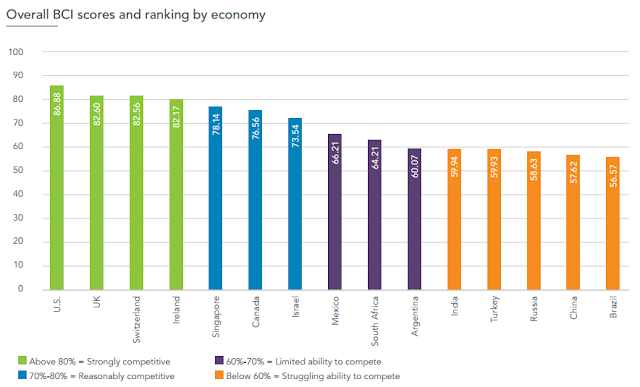 Consider Singapore, territory is so small, you can travel around it by train within 2 hours, yet it can host 4.5 M people + several millions foreign visitors and foreign workers more. Comments by friends to the above proposal. The photos are not part of their comments, I just added them, copied them from various sources in the web. 1. Lai R: I would like to donate the Spratlys Island, Ayungin Shoal and Recto Bank. Also Sabah. 2. Christine FG: Would have been ideal if only the migrants are not so single-minded in trying to reach Germany and Sweden. All other locations are not good enough for them. 3. Hector B: The solution is to force Syria to take their people back. 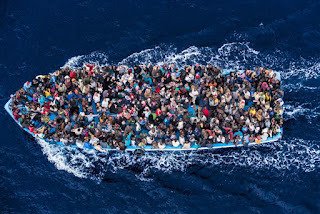 The policy should be that any nation which degenerates into a failed state by generating more than 300,000 refugees should be given an opportunity to take the refugees back and restoring order under UN supervision. If they refuse or fail to take back the refugees and get their act together. The state shall automatically be considered as a failed state and devolve into a UN trust territory. The goverment shall be dissolved and the state shall be reoganized into a commonwealth under UN governance. 4. Francis B: The only way to handle refugees is to immigrate and integrate them. We should also be free to be picky about who we let in. Remember, these people are not immigrating by choice and so, may not really care about becoming part of the host nation. On #3: It may not be the Syrian government that will fry and butcher the refugees if they decide to come back, it might be their fellow ordinary Syrians. Leaving Syria was a great risk. Going back will be an even greater risk. Many EU governments have already recognized that they need to help. The question only is how much help they can house and accommodate, even temporarily. Almost all experiences of secession were successful -- Taiwan from mainland China, Singapore from Malaysia, East Timor from Indonesia, the many "stan" from former USSR, and so on. All refugees have experienced political persecution one way or another, so it is something that they will try to avoid if they have the chance to build their own nation. On #4. 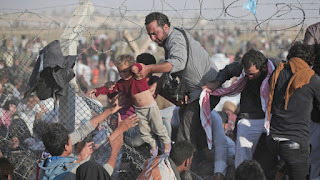 The reason why those hundreds of thousands of Syrians are seeking refuge in other countries is precisely because the UN, the Syrian and other MidEast governments, ALL of them cannot ensure the lives and safety of those people. They are either helpless or unwilling to protect the lives of those refugees. The Economic Freedom Network (EFN) Asia has a new, dynamic institutional member, the Center for Indonesian Policy Studies (CIPS, http://cips-indonesia.org). Congratulations, Rainer Heufers and team. I wrote about the CIPS last June, CSOs and State 22, CIPS' Community Schools Project in Indonesia. It's a noble project by the Institute and further confirms that more civil society role, more voluntary involvement and engagement of people without coercion, is a more effective way to build a more dynamic, more peaceful society. Below is part of the questionnaire and CIPS' answer. More collaborative work with you and CIPS team, Rainer. Am glad that the CIPS is officially a network member now. Congrats again. 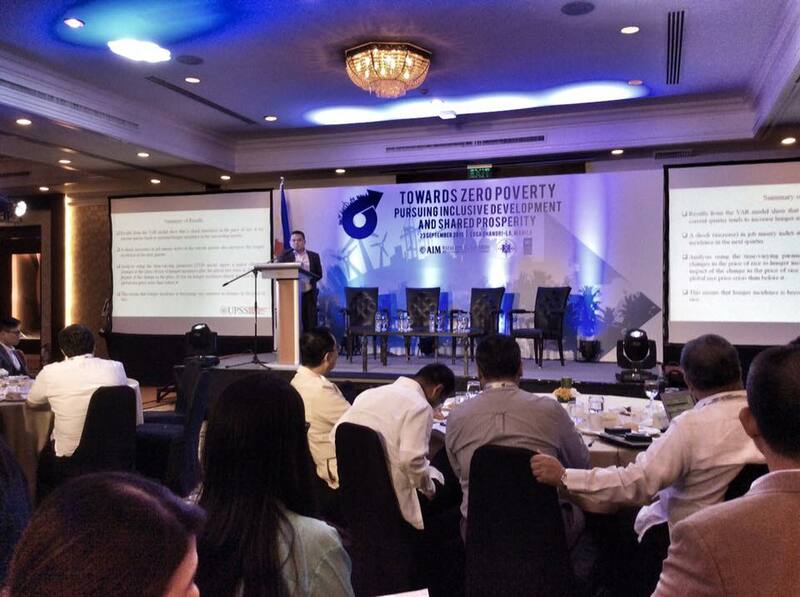 The other day, September 23, I attended a forum on "Zero Poverty" organized by the AIM R.Navarro Policy Center, NEDA and UNDP, at Edsa Shangrila Hotel. I don't believe in "zero poverty" of course, but I went there to hear what the speakers have to say and see their numbers/data. In the morning session, the focus was on food poverty and speakers were former NEDA chief Cielito Habito, UP School of Statistics (UPSS) Dean and Prof. Dennis Mapa (speaking in this photo), IRRI Dep. 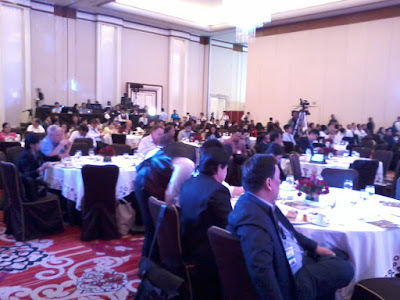 Administrator Bruce Tolentino, and DTI Assistant Secretary Fita Aldaba. 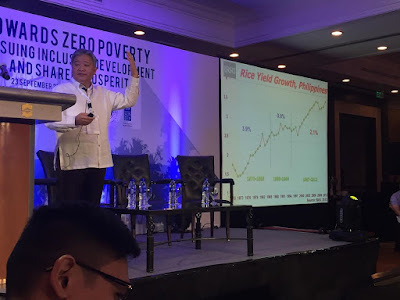 Jess Lorenzo posted that photo in fb with a note, "Dr. Dennis Mapa explains how rice price shocks have a direct correlation in hunger incidence.... IN JUST ONE QUARTER! He also notes that the effect is becoming more dynamic." Below, Bruce Tolentino of IRRI, also posted by Jess. Dennis and Bruce showed one chart, global and PH rice prices over the past 15 years or so. Notable in that chart was that around 2008 or 2009 until today, world rice prices were declining and remained low but PH rice prices were high. 1. "Zero poverty" is not possible under a rice protectionism policy (via quantitative restrictions or QR in rice imports, NFA importation monopoly, taxation of imported rice) which significantly contribute to higher local rice prices. 2. Huge National Food Authority (NFA) debt, about P160 B as of end-2013 and could be around P170 or P180 B now. At just 3% interest rate, we are paying P5B or more each year on interest payment for the NFA debt. 3. Need to allow large scale corporate rice farming. This will contradict the endless, no time-table, agri investment-busting agrarian reform (AR) program. Rice farms then will use science-based, biotech and mechanized farming and allow 5-10 MTs/hectare vs. current productivity of around 3.8 tons/hectare. Plus lower post-harvest losses. For nature-created poverty, say a huge flood wiped out people's houses, crops and tractors, vehicles and other properties, government assistance will be useful and justified. For self-inflicted poverty like laziness and irresponsibility, no amount of government assistance and intervention will solve it. That is why there should be more personal, parental, civil society responsibility in society, less government responsibility. The latter should focus on enforcing the rule of law and protecting the people's three basic freedom: freedom of private property ownership, freedom from aggression, and freedom of self expression and liberty. * This is my article in BusinessWorld last September 22, 2015. Many people take this for granted. 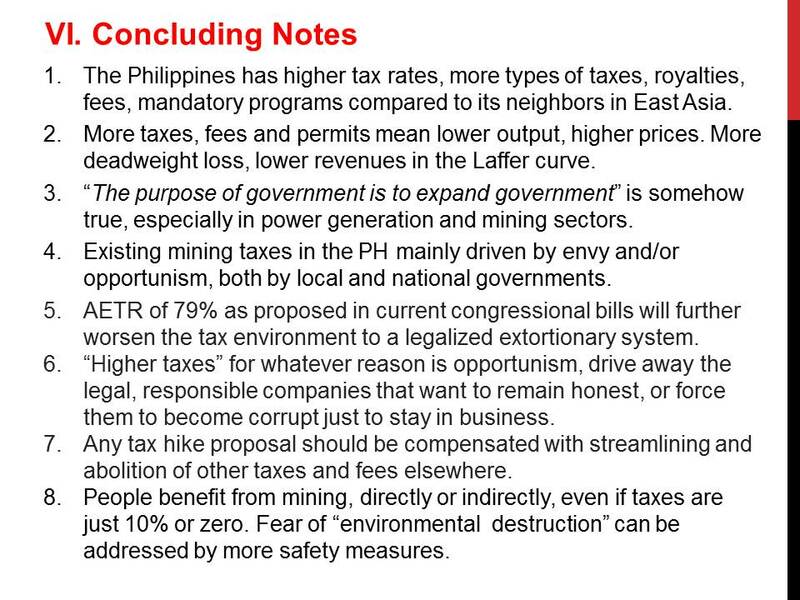 That is why many people hate mining, especially big corporate mining and wish that there will be “No Mining” policy in the whole country soon. 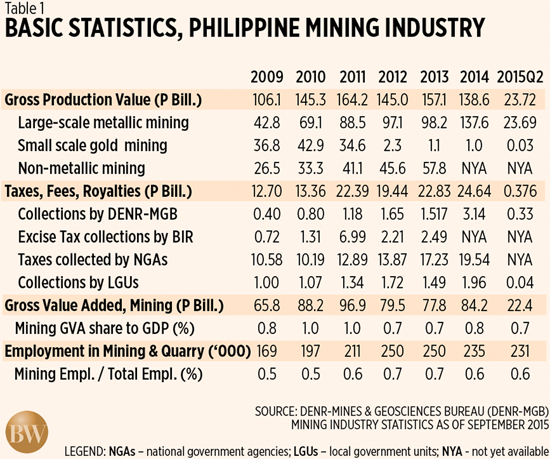 The contribution of mining in the Philippine economy looks small. Just 1% of gross domestic product (GDP) and only 0.6% of total employment. And so the temptation to “Close all mining” calls continue. But read the first paragraph again. People only see the stones, rocks, and soil being removed from a particular province, the mud and tailings that flow during heavy rains while ignoring the fact their gadgets, appliances, vehicles, buildings, electrical cables, and wires come from those rocks and soil extracted somewhere else. 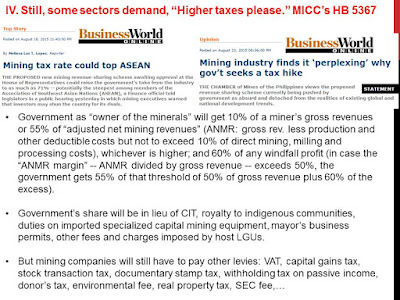 Between “No to Mining” and “Allow Mining” is the philosophy of “Over-tax, over-regulate Mining”, and this is what we have now. 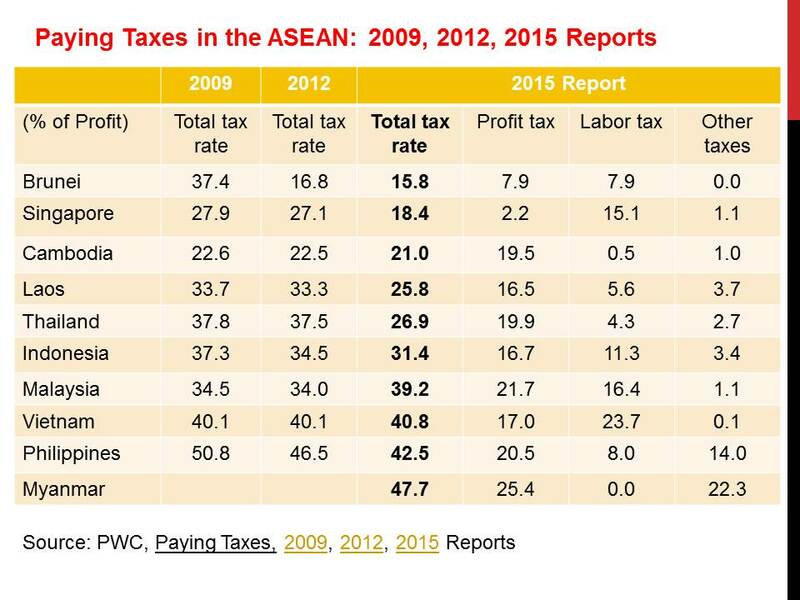 First, the Philippines has the highest value added tax (VAT) or gross sales tax rate in the Association of Southeast Asian Nations. 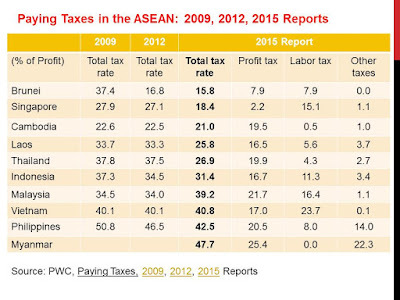 And second highest in corporate income tax (CIT) at 32%, next to Myanmar’s 35%; it is almost twice the CIT in Singapore of only 17%. Second, the number of taxes, royalties, regulatory fees, contributions and mandatory community expenditures that a mining company must pay is rising through time. 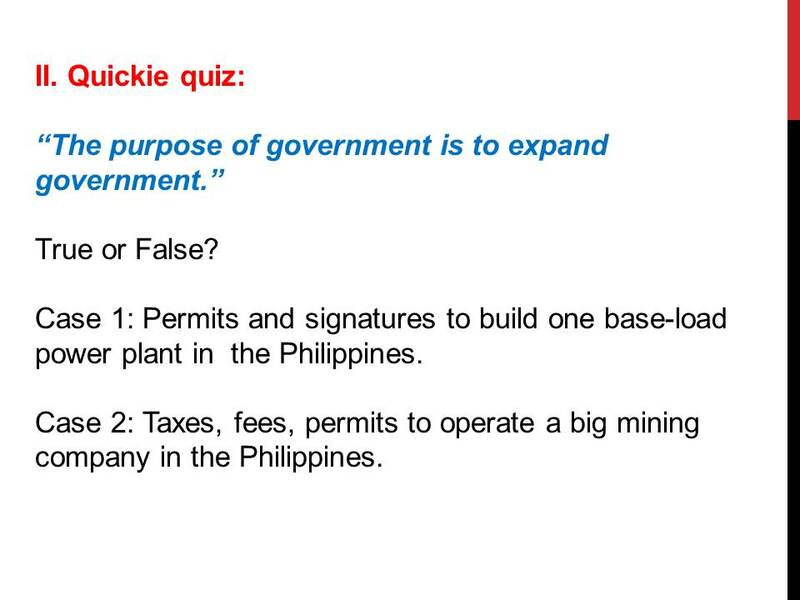 Thus, after paying those taxes and fees to government, supposedly to finance public education, public health, public housing, public roads, various livelihood trainings and seminars, a mining firm must spend extra to build its own school and training center, own hospital and clinic, own housing, own roads, drainage and street lighting, conduct livelihood trainings, and so on via social development and management program (hundreds of millions a year), environmental protection and management program, environmental work program, etc. 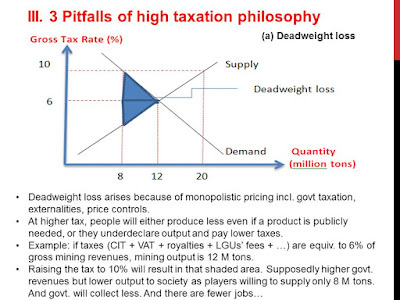 It is obvious that the over-taxation and over-regulation of mining is driven by envy and political opportunism. Mining and extractive companies are next to evil so governments and the communities that host them should extract as much social and economic rent from them. There are proposed revisions to current mining tax and the most dominant proposal coming from the Mining Industry Coordinating Council (MICC) is proposing an even higher taxation and government share. 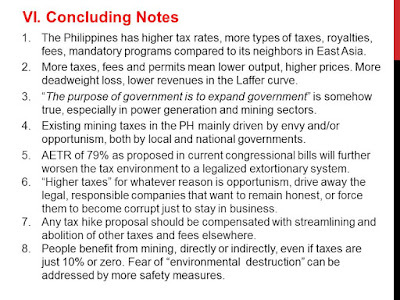 House Bill 5367, the MICC version, proposes that government as “owner” of the minerals should get 10% of a miner’s gross revenues for the year, or 55% of “adjusted net mining revenues (ANMR)” (ANMR: gross revenue less production and other deductible costs but not to exceed 10% of direct mining, milling and processing costs), whichever is higher; and 60% of any windfall profit (in case the “ANMR margin” -- ANMR divided by gross revenue -- exceeds 50%, the government gets 55% of that threshold of 50% of gross revenue plus 60% of the excess). 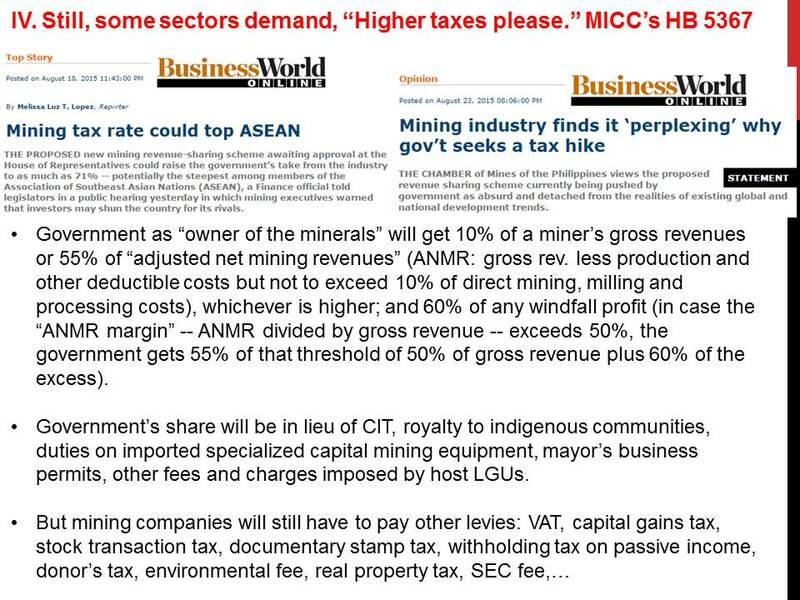 The consolation is that those high taxes will replace the CIT, royalty to indigenous communities, duties on imported specialized capital mining equipment, mayor’s business permits and other fees and charges imposed by host local government units (LGUs). The non-consolation is that other existing taxes and fees will still be paid,like the VAT, capital gains tax, stock transaction tax, documentary stamp tax, withholding taxes, environmental fee, real property tax, Securities and Exchange Commission fee and soon. It is not good to create public policies, in taxation and mandatory fees and contributions in particular, based on envy. 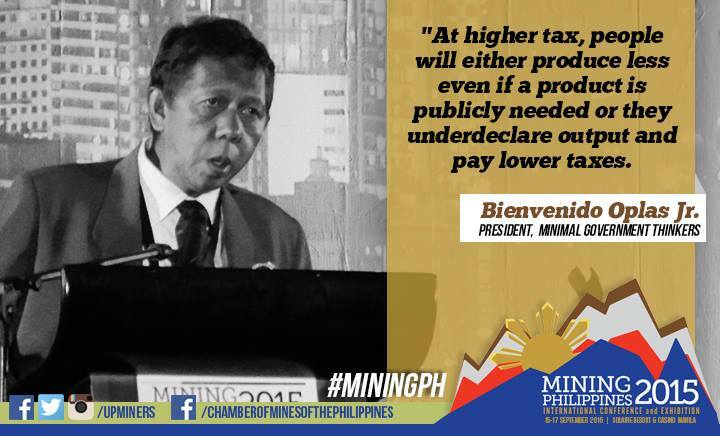 People benefit from mining, directly or indirectly, even if taxes are just 10% or zero. It is the fear of “environmental destruction” that is paramount in the hearts of many people. So long as the company institutes measures and spend huge money to control or minimize such danger, the politics of envy should be curtailed. Imposing very high taxes and complicated requirements will drive away the legal, large, responsible mining companies that want to remain honest. Or it will force them to become corrupt just to stay in business. 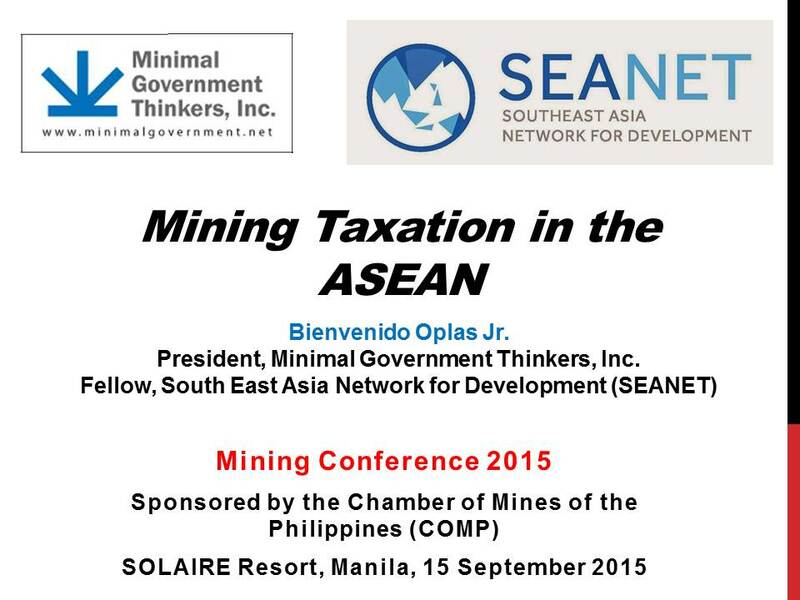 “Small-scale” and illegal mining that are hardly taxed and regulated will flourish. Tax hike proposals should be compensated with streamlining and abolition of other taxes, charges, and over-bearing requirements. Bienvenido S. Oplas, Jr. is the head of Minimal Government Thinkers, Inc. and a Fellow of the South East Asia Network for Development (SEANET). 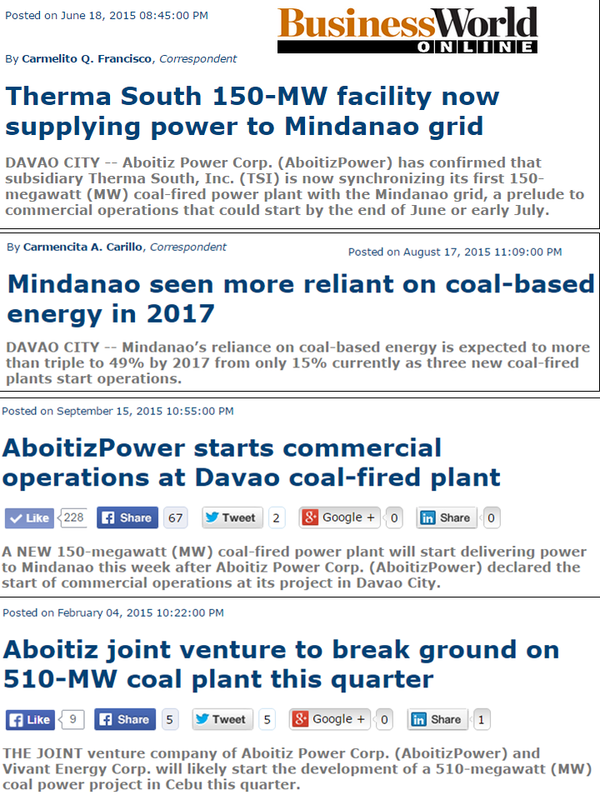 This means that the Philippines has no right to cheaper and more stable electricity sources? We have the second highest electricity prices in Asia already, next to Japan, and coal power is cheap compared to oil and the renewables, so why should that power source be restricted? 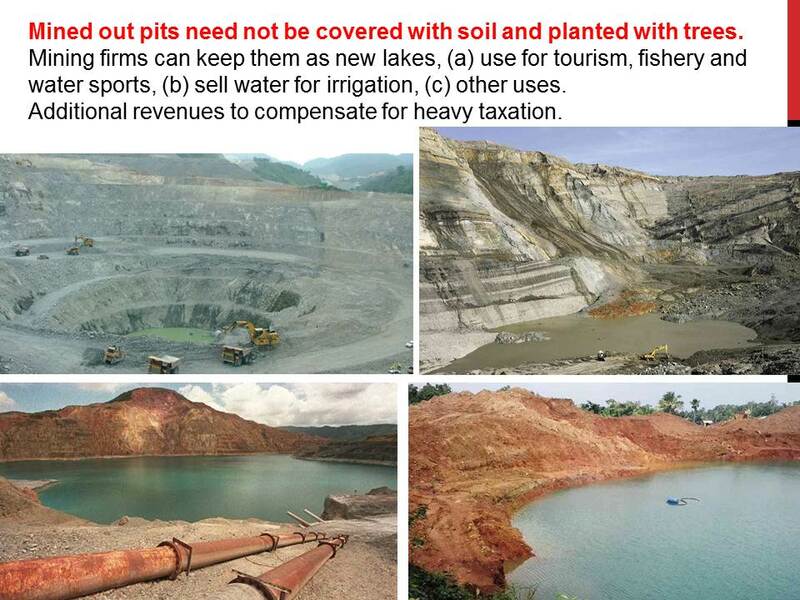 It is a wrong move or policy by the DENR. It is not possible for the Philippines to grow faster if its electricity prices remain expensive and there is regular power disruptions and brown outs, especially in Mindanao. Here are some recent reports about power development in Mindanao and the Visayas. 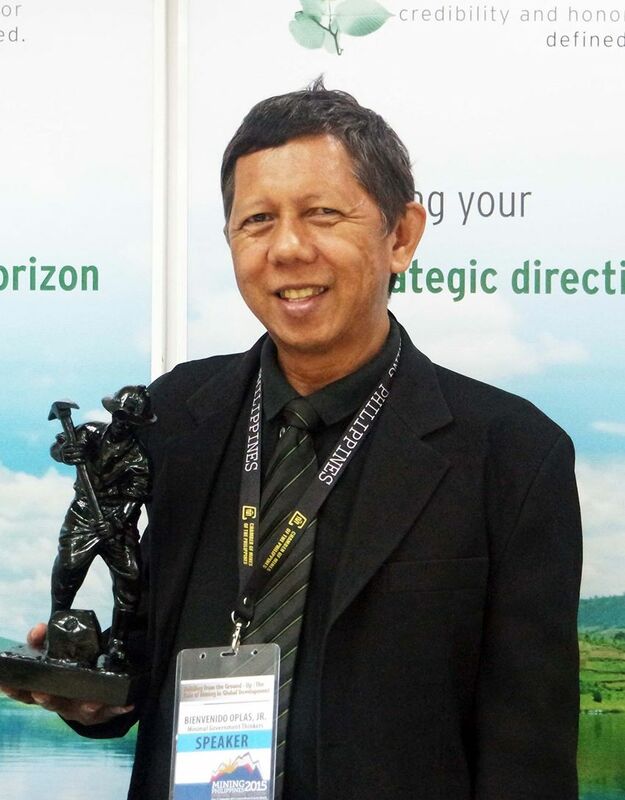 “The share of fossil fuels in the energy mix is rising from a mix of 45% fossil and 55% renewable energy (RE) in 2015 to 67% fossil and only 33% renewable energy-sourced power by 2017,” said Romeo M. Montenegro, director of investment promotions and public affairs of the Mindanao Development Authority (MinDA). The other fossil sources are diesel-powered generation plants. The entire plant is slated for commercial operations in 2018. The project site for the project was acquired in December 2011 and an environmental compliance certificate for the plant was secured in May 2013. Therma Visayas, the project proponent, is majority owned by AboitizPower with its 80% interest. Vivant Energy, a subsidiary of listed Vivant Corp., on the other hand, holds the remaining 20%. Government, through the DENR, DOE, local government units (LGUs) and other agencies, should step back from imposing more regulations as to what power plants should be curtailed and be subsidized. If the government is serious in having fast and sustainable growth, cheaper and stable electricity is among the most important prerequisites. Energy development precedes economic growth. Reposting (with permission) some comments and questions by a friend, JB Baylon, posted in his fb wall. Then my additional comments below. The photos I got from the web, added here and not part of JB's original posting. There is something wrong with headlines of news items about the LP. 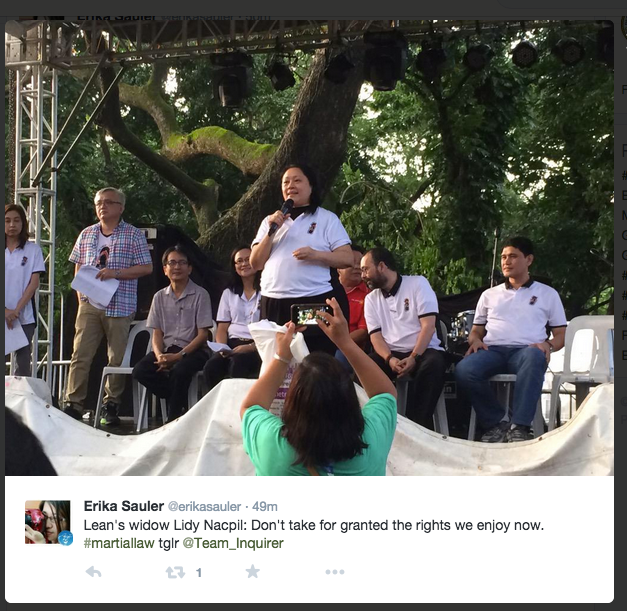 This one says Sec Mar's mom stopped a party leader from quitting. Another one says PNoy has chosen Leni Roberedo to be the running mate. Excuse me. It is Sec Mar who is the candidate now. It should be he who is making these decisions - or at the very least delegating to others the making of these decisions. He needs to be seen as his own man now - and these headlines are not helping. Either the stories are not accurate - or something has to change in the way the LP makes its decisions. We want to know that we will be voting for Mar Roxas the man qualified to be President -- not for PNoy the soon former President, or Judy Roxas the mother of the candidate for President for goodness' sake! To Vice President Binay: how do you respond to all the allegations of corruption beyond claiming they're politically motivated? Why is your close associate Mr Limlingan still unaccounted for till now? Could he by any chance be on the space shuttle to Mars? To Secretary Roxas: why should I vote for you given your dismal record at the DOTC and the unremarkable record at the DILG? You claim that politics never figured in your work, but what about the Yolanda brouhaha with the Tacloban Mayor? And the fact that the President sidelined you on Mamasapano - isn't that a reflection on the amount of trust - or lack of it - that he has in you? 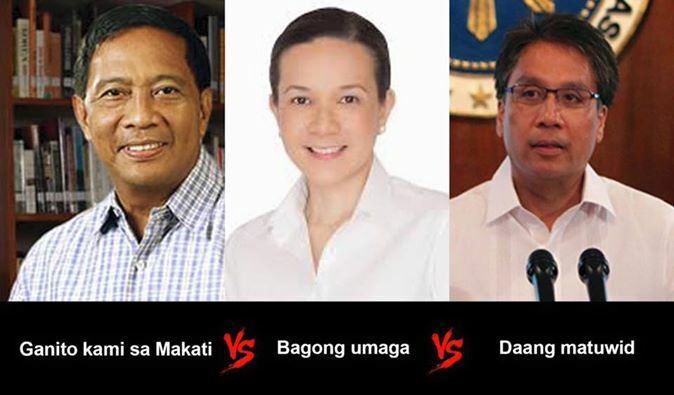 To Senator Grace Poe - the citizenship issue aside, you have the thinnest public service record among the three candidates. We require commercial pilots to have a certain number of flight hours before we entrust them with a commercial aircraft. I will not agree to being operated on by a fresh graduate of Medicine. Explain to me why in your case we the voters are effectively being asked to put our trust in someone who in other professions wouldn't be the lead and yet is aspiring for the Presidency of the Republic! Now aren't these the questions we should be pressing on our candidates??? And here are my questions to the three declared Presidential candidates. For VP Jojo Binay: You promise more subsidies, more welfare programs nationwide if elected President and yet you also support cutting income tax rates. How do you plan to sustain the budget for more welfarism without resorting to higher taxes elsewhere plus endless borrowings? Or you are silent about your hidden plan to raise taxes elsewhere and continue endless borrowings? For Sen. Grace Poe: Lots of questions about your citizenship, you voluntarily gave up your PH citizenship (to become a US citizen) and reacquired it later. Your kids remain US citizens until now. Answer those questions convincingly. And you justified the Iglesia illegal, stupid occupation of Edsa for 3D/3N that created heavy traffic, cancelled flights, meetings for many people. Do you still justify the Iglesia bullying and arrogance? For Sec. Mar Roxas: DOTC during and after your term (succeeded by another LP leader Sec. Jun Abaya) is lousy, inefficient and corrupt. I don't even have a plastic driver's license, don't have that new car license plate until now, after fully paying for them last May and April, respectively. As a Liberal leader, do you intend to keep the current BIG and bureaucratic government size, or trim it down? Pahabol kay VP Binay: You are lying when you repeatedly declared in your provincial sorties that "you made Makati rich" in your nearly 30 years leadership (you, your wife, young son Junjun). What, Makati before was poor and you made it rich??? First time I set foot in Makati as a probinsyano from Negros Occidental was in 1980. I saw the high rise buildings, clean streets of Ayala ave. and surrounding areas. Makati was already rich even before you were appointed as OIC Mayor. Please stop your lies, VP Binay. Yesterday was the 28th year since the great UP Diliman student leader, Lean Alejandro was killed. He was shot in the head, day time. Suspects were military/AFP people but there was no arrest, no prosecution that happened after the assassination. He was only 27 years old that time. Until 1986, perhaps there was not a single UP student who did not know or hear of Lean. Very articulate and eloquent speaker, intelligent writer, and yet very friendly and humble. He was a famous student leader in UP from around 1982-86. Then he graduated in 1986, became active with BAYAN, a nat-dem organization. I stayed at Narra dormitory in UP Diliman from 1983-85, then a "squatter" (would stay at friends' room from time to time) at Narra in 1986. I stayed at room 209 and he was at room 220, same corridor, facing Katipunan avenue. My roommates that time were from the College of Engineering (Joey Tiangco, Gort Goroza, Ariel Corpuz, all were batchmates from PSHS 1979), then my younger buddies from UP Sapul (Monching Romano, Norman Roxas, Gerry Mauricio). 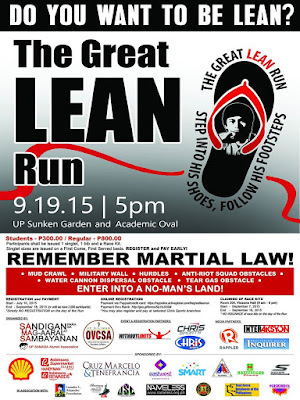 Lean's roommates were other activists Sarge Colambo, Jojo Abinales, and Alvin Batalla. Lean was tall while Sarge is short, good contrast in physical appearance but were philosophical twins. So we would meet Lean in the dorm corridor, or we would enter their room and have some short chat, or hear some of his discourses, or that of Jojo or Sarge. Lean rose to UP and national prominence at the dying years of the Marcos dictatorship (former President Ferdinand E. Marcos, ruled from 1965 to February 1986, almost 21 years). The military was king, especially from 1972 Martial Law declaration until its "lifting" in 1982 or 83. But this picture below was common until around January 1986. The police and military have long firearms ready behind batton-wielding policemen in the front. 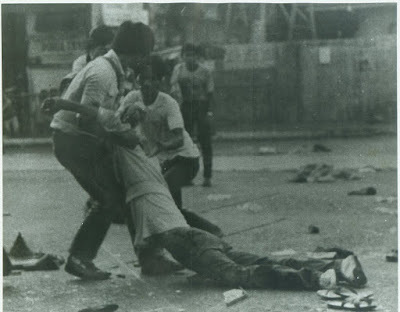 Another good friend, Fidel Nemenzo (a marathoner, now a faculty member at UP Math Department, and UP Vice President for research), was shot in the back by the police in another anti-Marcos rally in 1984. If Fidel was not athletic that time, he could have died with so much blood that puffed out of his body before he was brought to a hospital. Political assassination was common especially in the 70s. One can just disappear and never be heard after, especially if one is a lesser-known activist with high media prominence. 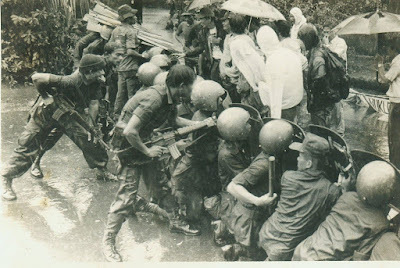 Many young people, those who were born from mid-80s up, do not realize how brutal the Marcos dictatorship was. And Lean Alejandro was the top student leader at that time nationwide. There were many other articulate student leaders like Elmer Mercado, Pepe Alcantara, Raffy Aquino, Chito Gascon, Gil delos Reyes, Kiko Pangilinan, Jolly Macuja, Louie Pangulayan, and so on. But Lean was an intellectual and physical tower of them all. When Lean was killed in September 1987, I was in Amsterdam, Netherlands. I was attending a 3-months course on Marx, Lenin, Trotsky and the 4th Communist International. I was a Marxist socialist at that time, affiliated with the first openly socialist organization in the country, BISIG. 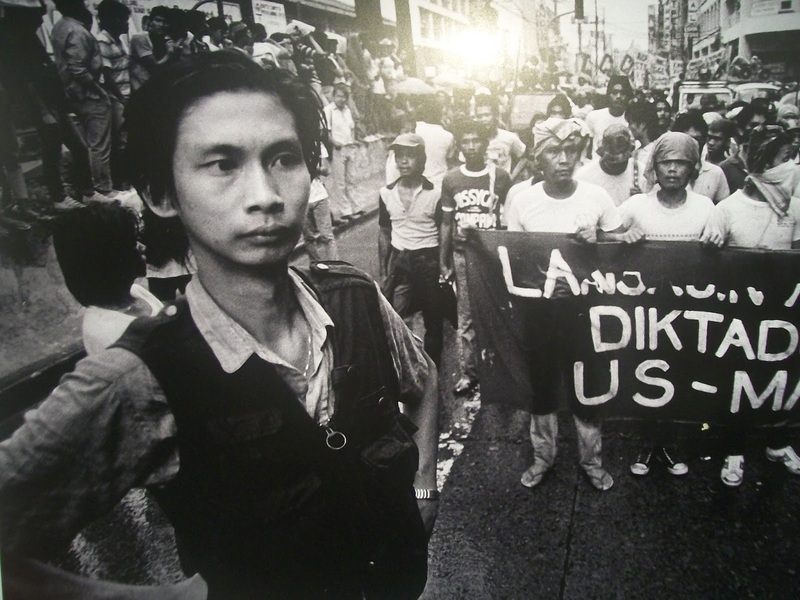 BISIG was openly socialist, BAYAN was nat-dem, the CPP-NPA line of passing by a "national democracy" (national, anti-imperialist; democracy, anti-feudal) stage first before marching to socialism. But even then, all left-leaning activists were angry, were enraged, at the murder of Lean. Political and philosophical differences are respected, murder is not. 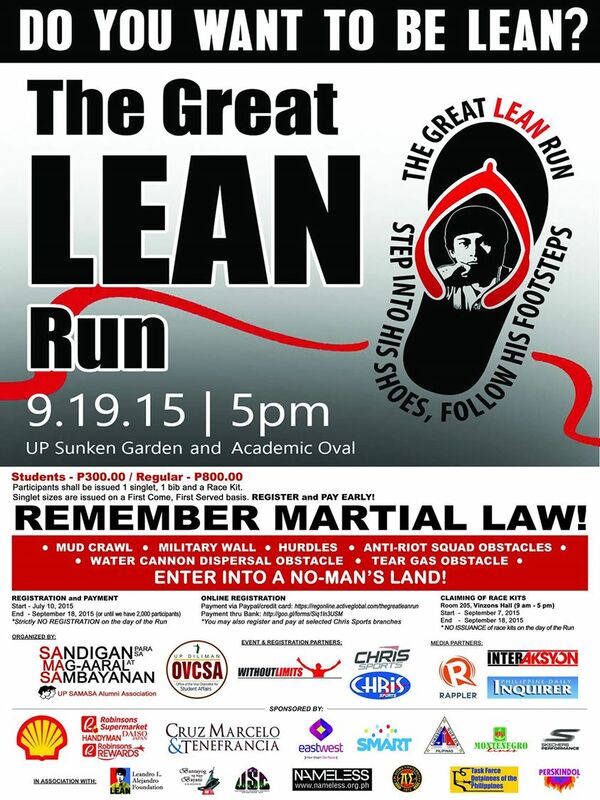 Yesterday, there was a fun run at UP Diliman to commemorate Lean's death anniversary. I wasn't there, and feeling sorry about it. Notice the media and corporate sponsors in the poster. Many key officials of these entities were friends and buddies of Lean that time, were moved and influenced by his intellectual power. From the photos, hundreds came and participated in the fun run, although there were rain showers. Lean's widow, Lidy Nacpil. She is a very lucky lady. She has the great opportunity to love and live with that intellectual giant of our time. All photos above taken from The Great Lean Run facebook page. I repost here some testimonies from two other friends, posted in their facebook walls yesterday. 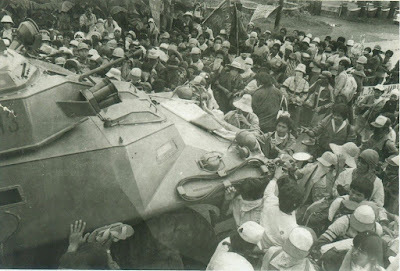 Taong 1987 nang nagpasya akong bumalik sa pag-aaral ng batas sa Pamantasan. 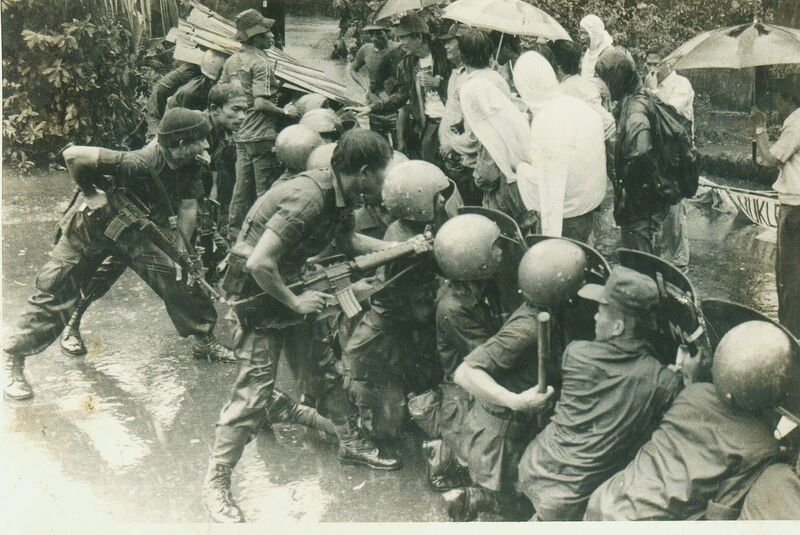 Noong gabi ng September 19, 1987, pauwi na ako sa Narra mula sa pag-aaral sa law library, may nakasulubong akong kaibigang humahangos na nagsabi sa aking "Binaril nila si Lean!". Dali-dali akong tumakbo papuntang dorm at marami nang mga residente ng Narra na nakakumpol sa TV room upang pakinggan ang malagim na balita. Narinig ko ang mga usap-usapan ng mga residente. Pinatay si Lean. Binaril sa ulo. 27 anyos lamang siya ng kitlan ng buhay. Nanghina ako sa sinapit ni Lean. 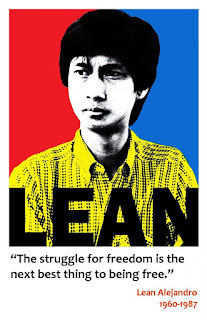 Nanghinayang ako dahil hindi pangkaraniwang lider-estudyante si Lean. 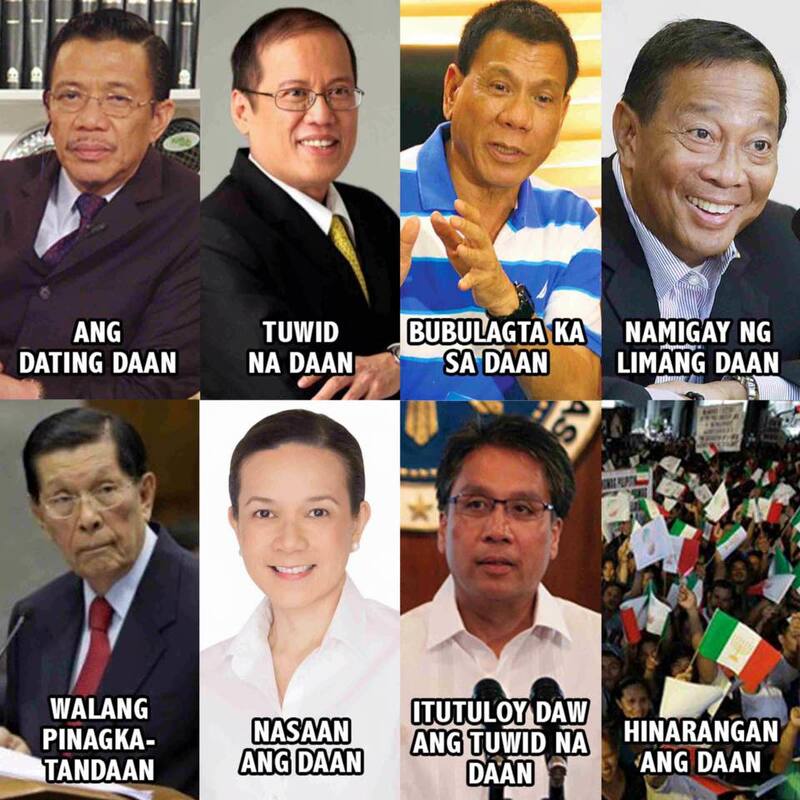 Magiting, matalino, matapang at mapanlikha; si Lean ay isang lider na ginagalang at hinahangaan, maging ng kanyang mga katunggali. Sa araw ng kanyang libing, hindi ako pumasok sa klase at sumama ako sa martsang naghatid kay Lean sa kanyang huling hantungan. Wala na si Lean, pero buhay pa rin siya sa puso ng sambayanang kanyang minahal at inalayan ng buhay. Hindi siya kailanman malilimutan. Isa kang naging inspirasyon sa libu-libong mga kabataan at estudyante nung dekada 80 at isa na ako doon. Sabado din noon, September 19, 1987, dalawampu't walong taon nang nakalilipas nung tumawag sa akin sa bahay sa Philam Q. C ang isang kasamahan sa UP Student Council (UP Student Regent pa ako nung 1987) upang ipaabot sa akin ang balita na binaril siya sa harap ng kanilang opisina sa may Rosal street sa Quezon City. Dinala daw siya sa St Lukes Hospital sa E. Rodriguez. Yun lang daw ang balita sa mga oras na yon. Dali dali akong nagbihis at namganeho ng sasakyan papunta ng ospital habang walang tigil na nagmumura at nilalabas ang galit sa kung sinuman ang nasa likod nung pagbabaril sa kanya. Sa tindi ng galit at walang tigil na pagmumura hindi ko na maalala paano ako umabot sa ospital. 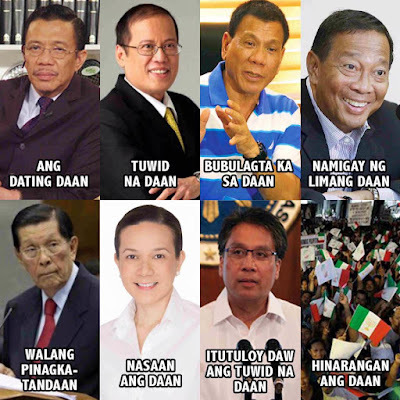 Pagdataing dun, nandun na sina Lidy at nandun din ang ilan sa mga kasamahan ni Lean sa BAYAN. Wala na daw si Lean. Hindi na umabot ng buhay sa ospital. Nanlumo ako. Nanghina at hindi makapaniwala sa mga pangyayari. 28 taon na ang nakalilipas ngunit hanggang sa ngayon naalala ko pa rin ang araw na yun. Malagim, malungkot, galit na galit at naghahanap ng paraan upang makapaghigante, parusahan ang mga salarin, makamtan ang hustisya. Maraming salamat Lean sa iyong pamumuno sa aming mga estudyante na sumunod sayo sa hanay ng mga kabataan at mag-aaral. It was both an honor and a privilege to have marched with you, Comrade. We thank you for offering your life for the cause of freedom and genuine social change. 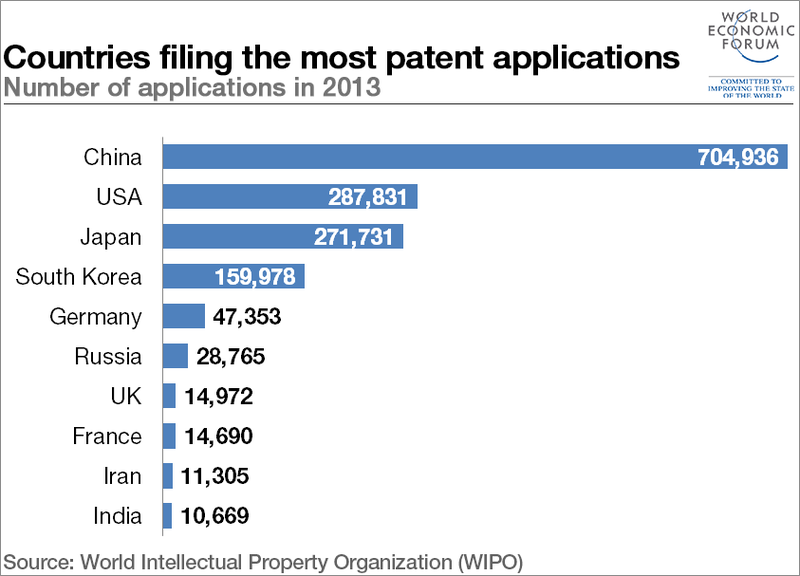 I was surprised to see this data from the WEF this week, that China has so many patent applications compared to the US, Japan, S. Korea and Germany. Original data is from WIPO. 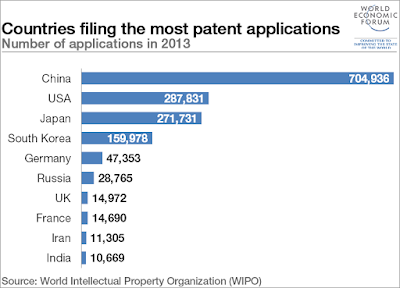 Anyway, Asia's four biggest economies are in the top 10.
source: WEF, Which countries file the most patent applications? September 14, 2015. Meanwhile, Reuters conducted its own study on the world's most innovative universities and the result for 2015 was released also this week. The study used 10 different metrics, criteria "focused on academic papers, which indicate basic research performed at a university, and patent filings, which point to an institution's interest in protecting and commercializing its discoveries." source: Reuters, The world's most innovative universities, September 15, 2015. 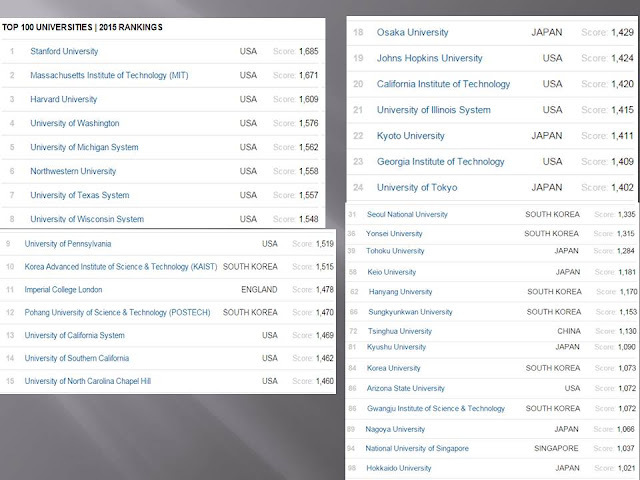 Nineteen (19) Asian universities landed in the top 100 mostly dominated by US universities. The Koreans are rising fast in the technology and innovation ladder, some brands are already top global players like Samsung. I'm curious if many of these top Asian universities are state-owned and operated, like the NUS. The top US universities though are private. Now there seems to be a "disconnect" between the two data above. China's universities are not so known in innovation (only one landed in the top 100, at least based on the Reuters study and ranking) yet China is #1 in the world in patent applications. More data and interpretation may provide the explanations. There are rush efforts this month to finally push a Trans Pacific Partnership (TPP) Agreement. Here are some few news reports, September 16-18, 2015. The costs of entry to the Trans-Pacific Partnership could include exposing the Canadian auto parts sector, which employs 80,000 people, to far more foreign competition and eroding the preferential position the industry enjoys under the North American Free-Trade Agreement (NAFTA). It could also cause headaches for dairy farmers by opening their sheltered industry to significantly more imports. Two to three days of talks will be held in the U.S. city of Atlanta. Free trade rules for most of the 31 areas covered by the TPP were settled at the last round of talks in July. But intense disagreement remains on dairy products, automobiles, intellectual property for pharmaceuticals, and other areas where national interests are at stake. Chief negotiators will meet ahead of the ministerial talks, seeking to lay the groundwork for consensus. 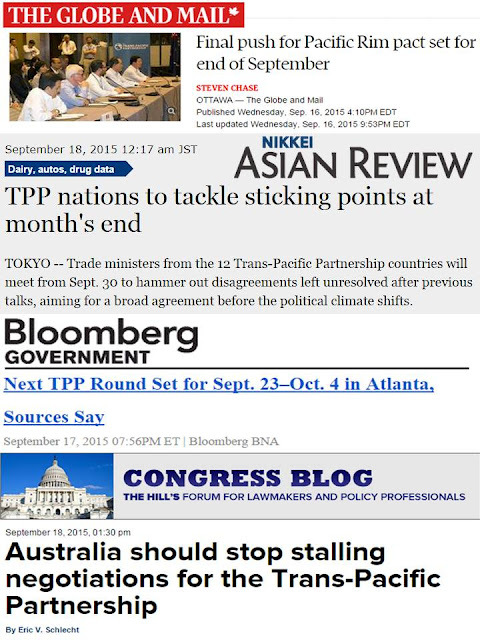 Sept. 17 (BNA) -- The next round of Trans-Pacific Partnership (TPP) talks will take place in Atlanta from Sept. 23–Oct. 4, with the trade ministers from the 12 Pacific Rim countries meeting Sept. 30–Oct. 1, several non-U.S. TPP sources told Bloomberg BNA. The sources said an announcement on the conclusion, in principle, of the agreement is expected Oct. 1, adding that the chief negotiators are scheduled to stay until Oct. 4 to clear up any loose ends. The best trade policy for any country of course is unilateral trade liberalization, both in tariff and non-tariff measures. Keep trade negotiations to the minimum, involving only products and services that can affect public health and safety, security. The rest of products and services, allow free trade, imports and exports. The second best trade policy is global, multilateral trade liberalization under the WTO. But both unilateral and global liberalization are far out at the moment. So the third best trade policy is regional liberalization, like the ASEAN free trade area (AFTA), NAFTA, EC, and so on. TPP is along this line. 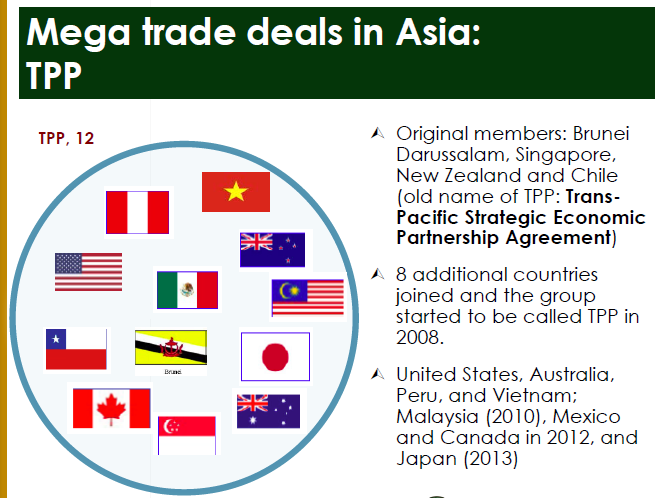 So a successful TPP Agreement will, overall, be a good and positive thing for the 12 member-countries. I wish that the TPPA will become a reality within the year. Meanwhile, there was a good presentation made by Dr. Ramon Clarete during the UPSE-Ayala Economic Forum in Manila last October 23, 2014, Going Regional: Which Mega Trade Deals Should the Philippines Join? - Bhagwati calls PTAs so. - However the WTO under its GATT 1994 allows PTAs. - But the ‘termites’ increased in number: 70 before 1990s, 300 in 2010, and 432 in 2013… and growing. - Most PTAs are bilaterals, free trade areas, and trade and investment agreements. - But then came the mega trade deals in the last decade. - Risks having trade rules by trading blocs, Back to ‘great powers’ world of the 19th century. TPP: gold standard for PTAs? - Since the 1990s, about 300 preferential trade agreements (PTAs) entered into force, were signed but yet to be implemented, or are being negotiated. Last Tuesday, September 15, I was one of the speakers during the opening day of the 3-days Mining Philippines 2015 Conference, held at the Grand Ballroom of Solaire Resort Casino Manila. Good audience, perhaps about 200 people. Opening speeches in the morning, then two focused group discussions in the afternoon. We were on the 3-5pm slot. This is my presentation, 28 slides total, showing 7 of them here. After showing various tables on comparative taxation in the region, I asked the audience of this question. About 4 hands were raised to say True, none raised hand to say False, the majority just waited for me to answer my own question. 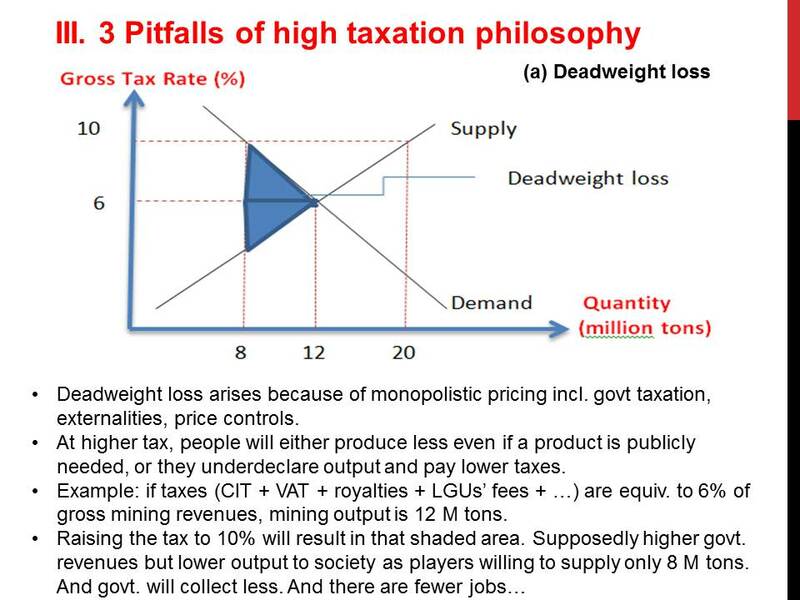 The 3 pitfalls are (a) deadweight loss, (b) declining revenue in a Laffer curve, and (c) non-recognition of the "multiplier effect" of mining as raw materials. 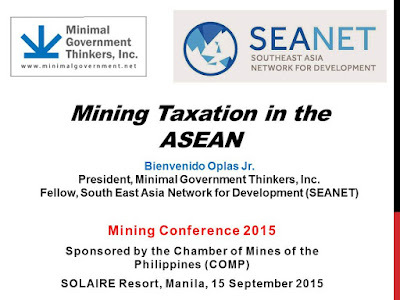 I showed 4 annexes -- mining taxation in Vietnam, Indonesia, China, and this proposal. My full presentation is available in slideshare and in dropbox. The UP Miners, an organization of Mining Eng'g undergrad students in UP Diliman, made this photo and posted it in fb. Thanks Niel and all. Meanwhile, I like these comments from two friends, Yani and Raul. 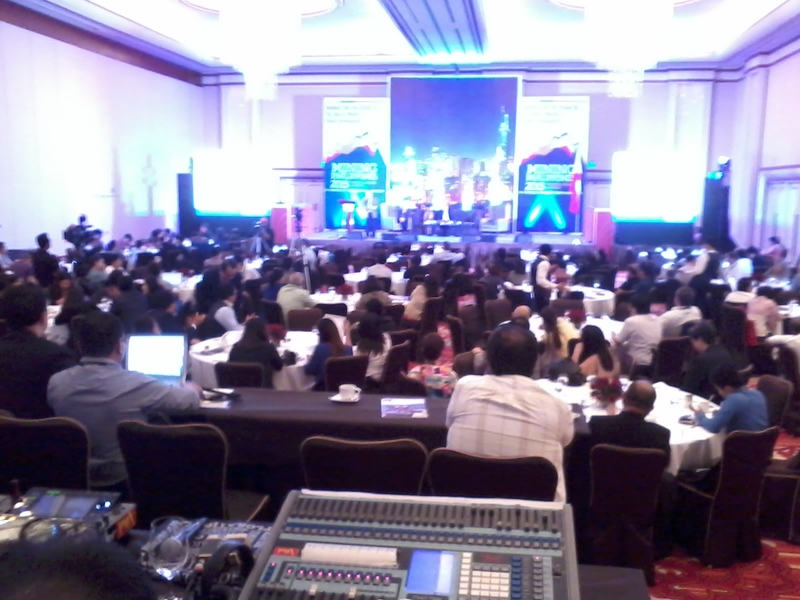 Bayani Camitan: noy, we have very much potential in this industry. in fact mining industry was a significant (if not today in the future) contributor to GDP. but then again, it is sad to say that government support is lacking and related policy is unclear. for one, we have as u may know Surigao (which is partly known for surfing) is the so-called "nickle-ore capital of the Philippines". it is one of the main supplier exporter of nickle ore competing against Indonesia for China market. 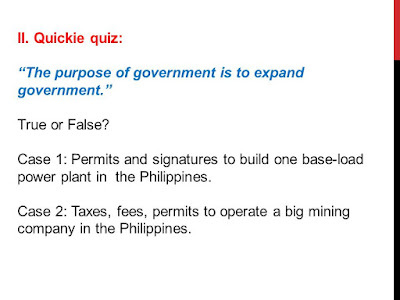 unfortunately the mining players in Surigao do NOT have a centralized laboratory for nickle ore testing; each of them has their own way to cheat if not hide the characteristics of this mineral ore. an act of one will spoil the whole of it. 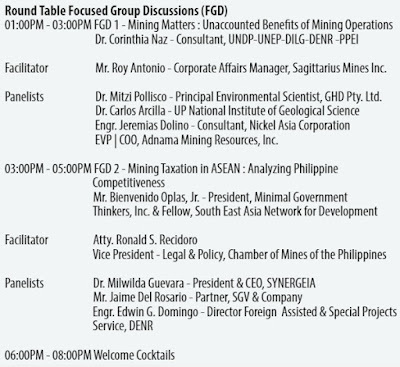 if only government could support and have a government-instituted laboratory which should be a common facility for about 14 mining companies in Surigao alone, with this guess we can be recognized in the world for this mineral ore.
Raul De Leon: That's the problem with government thinkers! Everytime they see an industry grow, the first thing they think of is to increase taxes instead of improving the collection system. Just like they did in the mid 90s when they saw the stock market boom. They imposed higher taxes on trades that lead to investors shying away from our market and invest else where. This wrong mindset of increasing taxes out of a booming industry has Instead yielded negative results to all stakeholders especially the government who has lost a lot of opportunities and losing to our asian neighbors by giving less incentive, more government involvement and lesser investor facilities. Goodbye Mama. I love you.